Automotive electronics customer required a portable test box which could perform a full functional test on-site at their major automotive customer. 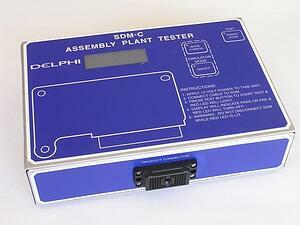 The unit is capable of emulating in-line production functional test in a highly portable package. The unit is designed with custom firmware which provides test control and execution, and also provides for data recording and eventual upload to a PC. The project also entailed development of a custom PC application to provide firmware update capability via USB connection as well as extraction of test data which was recorded. The overall design included circuit design, custom firmware, custom FPGA design, schematic capture, PCB layout, mechanical design, and full, turnkey fabrication of units and custom cable harnesses.